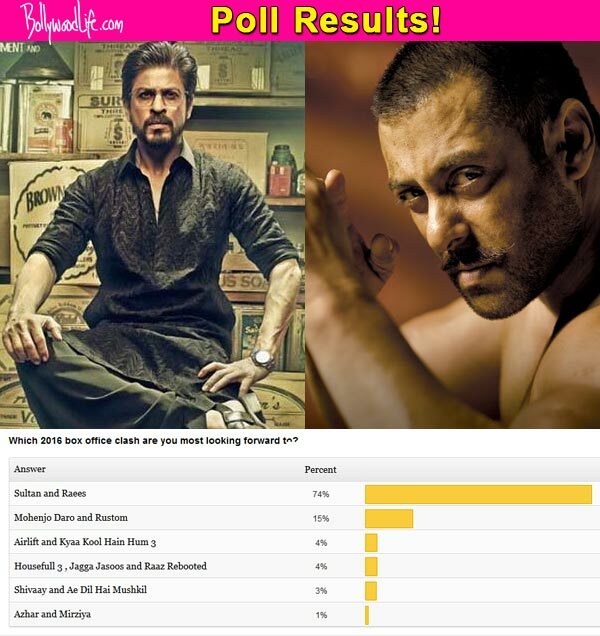 Salman Khan’s Sultan and Shah Rukh Khan’s Raees clash is the most awaited one in 2016, suggest fans! According to fans, the Sultan-Raees clash is the most awaited one this year as 74 per cent people are waiting for the ‘Clash of the Titans.’ While the films are set to clash on Eid as of now, we had revealed to you a few days back that Sultan will be delayed and the clash will be averted. However, with no official confirmation yet, this is the most awaited clash of 2016. The next most awaited box office battle in line is the Mohenjo Daro and Rustom clash which is far behind the Raees-Sultan clash. Only 15 per cent people are waiting for this clash. People aren’t interested in the other clashes such as the Airlift and Kyaa Kool Hain Hum clash (4 per cent), the Housefull 3 , Jagga Jasoos and Raaz Rebooted clash (4 per cent), the Shivaay and Ae Dil Hai Mushkil clash (3 per cent) and the Azhar and Mirziya clash (1 per cent). PrevShocking! FIR filed against Nawazuddin Siddiqui for allegedly assaulting a woman!